Lucky Frame knows how to bring music and games together to create charming new experiences, from the delightful music generation of Pugs Luv Beats to the tower defense meets procedural music toy brilliance of Bad Hotel—one of the best games on iOS. That dual-mastery coalesces once again in Wave Trip, a music generation toy masquerading as a simple space shooter. 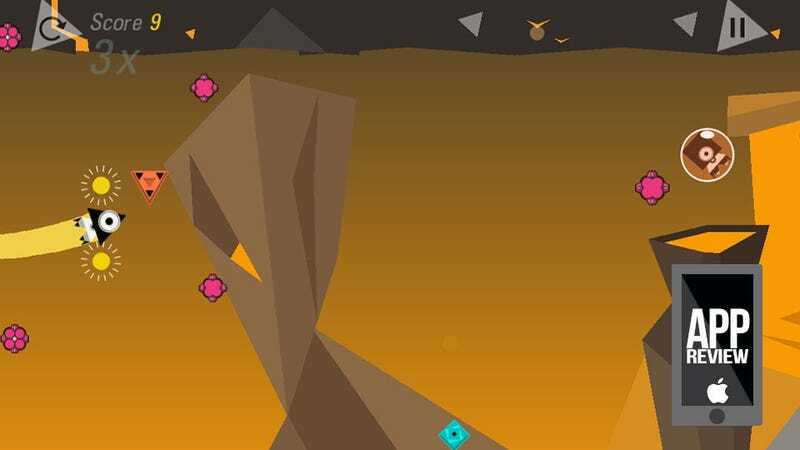 The Game: You play as a geometric astronaut attempting to free her friends, who've been trapped in floating bubbles hovering over alien planets. Using simple up-down controls (with a recharging shield for deflecting enemies) she collects orange coins to break the bubbles trapping her pals. Blue coins act as multipliers, helping players rack up high scores, but getting hit by an enemy resets the multiplier. So basically the idea is to collect as many blue and orange coins without hitting an enemy as possible. You can't die in Wave Trip—combo reset is the harshest penalty—so taken by itself it's a game about racking up points before the level ends.